We’re thrilled to announce that the CCC blog will be running some earlier articles from Gene Baur, Farm Sanctuary’s Co-founder and President and author of two best sellers, Farm Sanctuary: Changing Hearts and Minds About Animals and Food and Living the Farm Sanctuary Life: The Ultimate Guide to Eating Mindfully, Living Longer and Feeling Better Every Day. Gene’s experiences and insights can help us all be better examples of compassionate living. We start this series with part 1 of “Going the Distance for Animals,” from 2011. In this post, Gene talks about stepping out of our comfort zone in order to help farm animals. Bonus: Gene also gives us an abbreviated list of some of the incredible athletes that serve as role models in the face of the idea that eating animal products is necessary (just Google vegan athlete for more examples). This is especially relevant in this just-completed Olympic season (e.g., the only male US weightlifter to make the Games is entirely plant-powered!). Plant-powered Farris Kendrick sets a new American record. I have always enjoyed sports and the exhilaration that accompanies the human drama of athletic competition. I grew up playing Little League baseball and Pop Warner football. In high school and college, I started running cross-country and playing Ultimate Frisbee. After founding Farm Sanctuary in 1986 and becoming a full-time activist, I spent less time pursuing athletics. But as my 50th birthday approaches, I’ve renewed my interest in sports, and I want to demonstrate that vegans can perform significant athletic feats. So I signed up to run in the Rock ‘n’ Roll Marathon in Washington, DC, on March 17, 2011. In the U.S., we are bombarded with advertising and “educational” campaigns promoting the notion that consuming meat, milk, and eggs is healthy, even necessary. Many people believe these myths and assume that it’s difficult, if not impossible, to be vegan, let alone to be a vegan athlete. But, in recent years, information about vegan living and athletic achievements fueled entirely by plant foods is better and more readily available. Olympic Gold Medalist Carl Lewis reports performing his best as a vegan, and Dave Scott won the grueling Ironman Triathlon six times as a vegan (the Ironman is an endurance race where competitors swim 2.4 miles, bike 112 miles, and then run a full marathon). Scott Jurek, a vegan ultra-marathon runner, is the seven-time winner of the 100-mile Western States Endurance Run. Elite and professional athletes are increasingly recognizing how plant-based nutrition can support top performance. So far, I’ve completed a couple of 20-mile runs to get ready. These long-distance outings have been challenging, but I’m feeling strong, and I’m looking forward to the marathon. Stay tuned for part 2 with an update on Gene’s running since 2011, as well as future posts from Gene! I’m going meat-free…How about you? If you’re familiar with the terms “death tax” and “energy exploration,” you can thank Frank Luntz. You can also thank him for the powerful quote above. Whether or not you agree with Luntz’s politics, his point rings true: language matters. When making the case for vegan eating, the words we use matter too. Some phrases appeal to meat eaters, and some phrases will be more likely to turn them off. Case in point: a study by British trade magazine The Grocer found that the public was more likely to embrace vegetarian meat products when the products were labeled “meat-free” instead of “vegetarian.” Over the past four years an increasing number of British supermarkets and vegetarian meat producers have switched labels from “vegetarian” to “meat-free,” and as a result they are seeing increased sales among meat-eaters. On this side of the Atlantic, vegetarian meat producers are catching on. 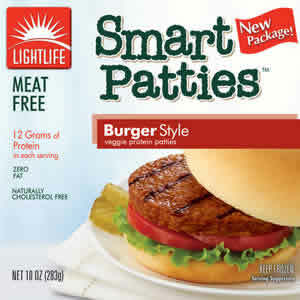 Pick up a bag of Gardein vegetarian meat, and you’ll see the label “I’m meat-free!” Even Lightlife is catching on, labeling their products “meat-free” or noting they are packed with “veggie protein.” Virtually none of their products still carry a prominent “vegetarian” label. Why does “meat-free” seem to go over better than “vegetarian” with the general public? Industry experts think the term “vegetarian” has negative connotations for many people. Maybe some have had negative experiences with vegetarians. Perhaps, due to guilt, social norms, or other reasons, they simply look down on all things “vegetarian.” For those over 30 years old, the term might conjure up memories of a flavorless tofu burger they tried back in college. Using the word “vegetarian” also raises the sticky issue of self-identity. The public may see vegetarians as a distinct group of people quite different from the average American. Ditto for vegans. That’s why, when asked about my diet, I don’t say “I am a vegan” or “I am a vegetarian.” I say, “I don’t eat meat.” I don’t want the people I’m speaking with to lump me into a box, as if who I am is determined by what I eat. More importantly, I don’t want them to think they need to take on a new identity – joining me in the box – in order to cut cruelty out of their diets. For a funny parallel example, consider the following. Which of these statements sounds more palatable to you? “You should become a Canadian,” or “You should move to Canada.” The first statement focuses on identity, while the second focuses on action. The second statement is probably more palatable to most Americans. When we leave issues of self-identity off the table, we make it easier for our audience to hear our message. When we use words that don’t have negative connotations in the minds of our audience, our audience will be more likely to listen. At times “meat-free” can sound a bit awkward when you try to work it into conversation. But after learning what the research has to say on this issue, I’m planning to use “meat-free” instead of “vegetarian” whenever possible. In other words, I’m going meat-free. How about you?